Not content with horrifying everyone with Horrible Histories and making knees tremble with ghastly Gory Stories, those Horrible authors are making hearts quake yet again with these revolting retellings of literature. 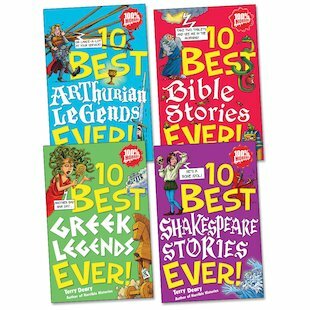 From bloodthirsty Bible stories to the gruesome Greek myths, and from awful Arthurian legends to shocking Shakespeare, they’re the best stories ever told – and the most horrible! Groan as Sir Gawain tries to keep his head! Shudder as Caesar’s spirit takes revenge! Moan at Medusa’s monstrous hair! Gulp as a whale eats Jonah alive! Get the full story – and get ready to say eeek! Really funny and informative. Terry Deary is a wonderful writer.